Contains: Spearmint, Eucalpytus, Rosemary, Fennel, Juniper Berries and Peppermint. Mentha Virdis (Spearmint) Leaf, Eucalyptus Globulus Leaf, Rosmarinus Officinalis (Rosemary) Leaf, Foeniculum Vulgare (Fennel) Fruit, Juniperus Communis (Juniper) Fruit, Mentha Piperita (Peppermint) Leaf. Spearmint Leaf, Eucalyptus Leaf, Rosemary Leaf, Fennel Seeds, Juniper Berries, Peppermint Leaf. "Use it for Tub Tea's, Bath salts, Bath bombs "
COMMENTS: I love this blend. I make tub teas with this, I add it to my bath bombs, I top my bath bombs with it as well. I also use it to top some of my soap loaves. It smells fresh, and good enough that I don't add scent to my tub teas. But that's just me. You can add fragrance or essential oils if you choose. I buy this all the time. Great value as well. I couldn't buy all these ingredients separately for this price. COMMENTS: Works great in Bath Tea Bags and Soap. Great natural scent.
" Winter Time Bath Tea Blend"
COMMENTS: Bests bath tea mix for sore muscles. my clients love it. COMMENTS: I add this to my bath bomb cauldrons customers love it. it adds a complex scent mixed with the FO or EO I use. love this product. 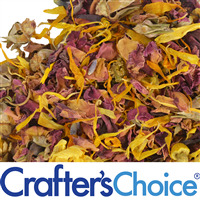 "A nice blend of dried flowers"
COMMENTS: I tried this blend in a bath tea with eucalyptus & spearmint fragrance oil, absolutely love it! Perfect for a bath soak. COMMENTS: I use this to make a different bath teas and customers love it! Very popular! 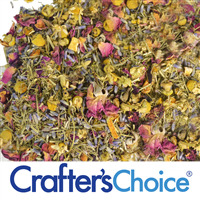 COMMENTS: This bath tea is great to add to my bath salts and it makes a wonderful addition to my soaps!! "Winter time bath tea blend"
COMMENTS: I put some of this tea blend in my bath bombs along with Epsom Salt and some Euc eo. A BIG hit at our local festival and a sold a bunch! When you breath this mixture in slowly... it just makes you feel more refreshed! COMMENTS: This tea bath has a wonderful aroma and is a big seller of ours in our area. COMMENTS: Love all of the different tea blends, use them for salts, etc. COMMENTS: Amazingly minty!!! So organic & fresh-smelling, I could just stand there with my head in the bag all day! The blend is very pretty too... Very earthy & botanical-looking! It's a wonderful blend!! 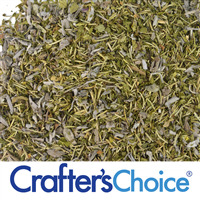 I purchased this during the January sale, along with the FO of the month: "Raw Sugar & Mint" (ahhh-mazing smelling btw!). I plan on grinding some of this tea blend very fine & incorporating it as a natural exfoliant in CP soap, using the Raw Sugar & Mint FO, and then sprinkling a little on top too! As an added bonus, I think I'll package some of this bath tea up in tea bags to sell alongside the soap! It's called "Wintertime Bath Tea Blend", but I truly think mint-lovers will enjoy this year-round! 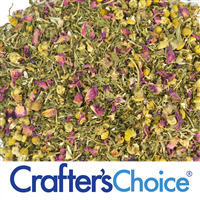 I'm officially addicted to WSP's bath tea blends now- they're all phenomenal & have many uses! • The perfect botanical blend! • Multiple uses to make products decadent! COMMENTS: I could not wait to get this product. Smells like winter time. I will use this blend in my bath teas. Love it! COMMENTS: The smell was fantastic for what I used it for. COMMENTS: I'm so sorry I missed the season for this bath! The smell is amazing! And I must say I love the summer nights and everyday bath tea...I will definitely be using/reordering this tea bath for the winter season...even though I can still sell it, which I may still do to get rid of the product, it seems it would be very beneficial in the winter because of the mixture. COMMENTS: I received a free sample of this in my coupon vault in December and I absolutely love it!! I will definitely buy this again! Wonderful scent and so relaxing! I used this for the bath tea. COMMENTS: Winter Time Bath Tea Blend is a great addition to Winter product lines. Customers love the soothing fragrance of this blend. A must for every product line. COMMENTS: I like the minty fresh notes in this blend. I'm trying it out as a bath tea in my line. COMMENTS: This makes a lovely bath tea, one that my clients love! • everything is blended for you! COMMENTS: Wonderful blend for my bath teas. Earthy and comforting. COMMENTS: Loved making bath tea bags with these. "Is there any specific amount I should add to a tea bag? There's no "maximum" amount that should be used in 1 bath right? I don't want to add too much"
Staff Answer There are not specific directions as to how much to add to a bath. The tea bags only hold so much product. 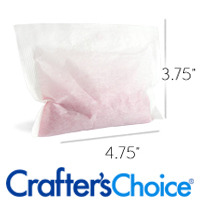 We would recommend 1-2 small tea bags and 1 large tea bag per bath. "Would I add the tapioca starch to the salts and then add the fragrance? What ratio would the salt to starch be? " Staff Answer You can coat the salts with tapioca starch, then drizzle the fragrance over them. Then, lay them out to dry overnight. You do not need much tapioca - just enough to lightly coat the salts. "Can your bath teas be mixed in with m&p soap? Will they turn brown?" Staff Answer Adding any botanicals to MP soap will make them turn brown. 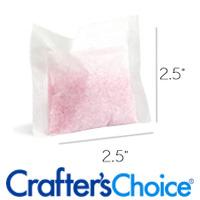 "I want to use a small amount of this product crushed (like a powder) in a sugar scrub. I am using Crafter's Choice Whipped Soap as the base for the scrub adding some coconut and Avocado oils in the mix. Also, I made an infusion consisting of coconut oil and the tea blend. If I add a preservative like Phenonip will the risk of fungus be minimized? I like the fragrance it produce and the organic look the crushed herbals gives to the scrub. Thanks!" Staff Answer This is something that would need to be challenge tested by a lab to be sure nothing is growing in your product. "If I wanted to add Winter Time Bath Tea to a salt with other EO, could I use Slick Fix - Oil Locking Powder as the tapioca starch suggested? If so, how much would you use per pound of oil or salt? " Staff Answer Yes, you can add the Slick-Fix to your tea/salt mixture. We recommend mixing the salts with the Slick-Fix (you might start with 2 parts salt to 1 part Slick-Fix) and then add your fragrance oil. Blend mixture well, then lay out to dry overnight. The salts can then be blended with the bath tea and packaged. "I'd like to add Epsom salts and/or oatmeal to this. How much per pound?" Staff Answer You can add as much as you like. You can mix equal parts with the bath tea, 80-20, or whatever you like. Test a small batch first to see what blend you like best.